now in print once again and available in its newly-translated third edition! On the way back to the Cave from the printer~~! Please arrive 10 minutes before the event begin! We are filled with joy and gratitude to announce that the day has finally come to present to you these precious jewels – the Sacred Words of our Revered and Honorable Guru, Satguru Shri Mahayogi Paramahansa! To mark this joyous occasion we will have the opportunity to present The Universal Gospel of Yoga at the Integral Yoga Institute of New York, and all are invited to attend. The presentation will consist of a short performance, readings from The Universal Gospel Of Yoga and anecdotes offered by three sangha members about different aspects of The Universal Gospel of Yoga. It has been quite some time since the decision was made to re-translate The Universal Gospel Of Yoga in 2012 when the supply of copies began to dwindle. And after nearly four long years, during which The Universal Gospel of Yoga was essentially out of print, we feel compelled to humbly apologize to our Guru that it has taken so long to complete the editing process and thus enable his words to reach the countless hearts who have been yearning for these teachings of Truth. 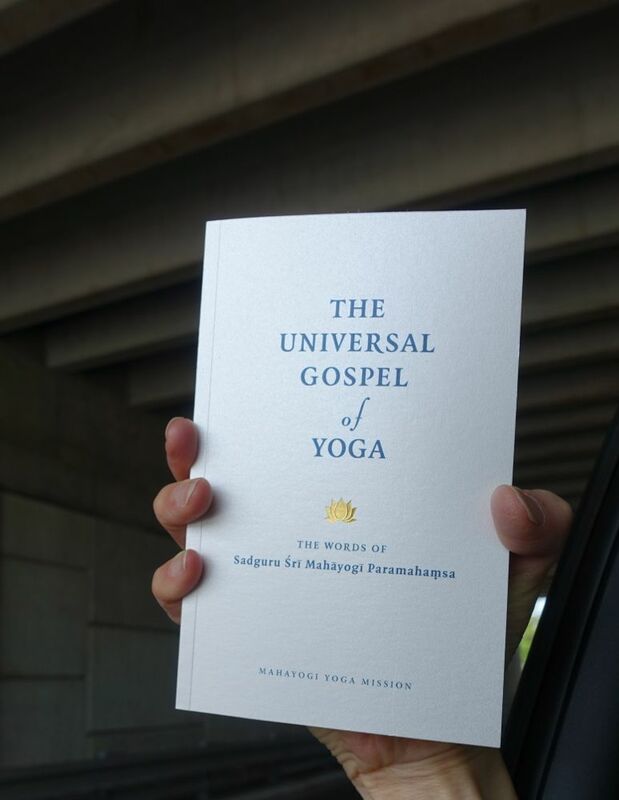 With the release of this new edition we aim to ensure that The Universal Gospel of Yoga will be available to all who seek the authentic teachings of Yoga for many years to come. To convey the excitement and enthusiasm that we feel at finally being able to announce this momentous occasion, we would like to share an excerpt from a speech given by Anandamali during Jayanti, the annual celebration commemorating Shri Mahayogi’s birth at the Mahayogi Yoga Ashrama, on November 23rd 2013, in which she spoke about the sangha in New York and expressed the depth of her emotions toward The Universal Gospel Of Yoga and the editing team that was working with her on this new edition. 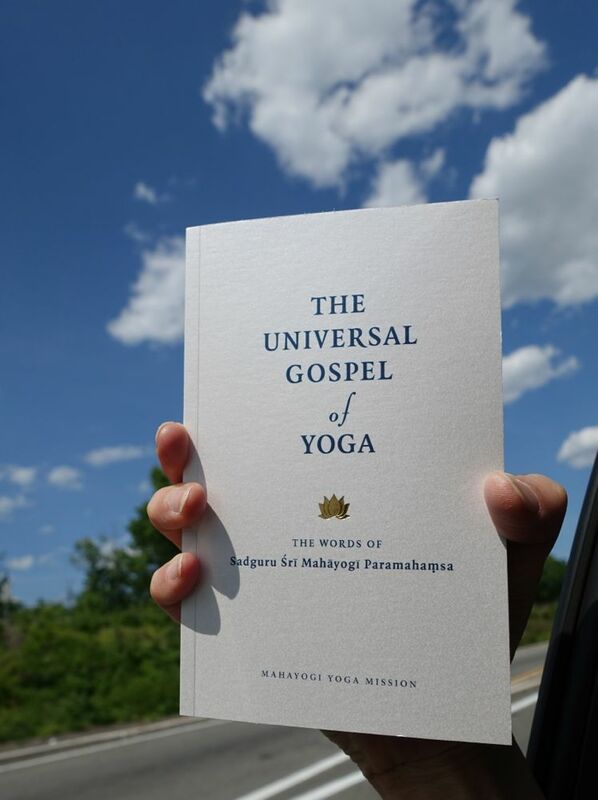 “… … Currently in New York, although there is only a handful of staff, we are working on the final stages of editing The Universal Gospel Of Yoga, which has been fully retranslated. Once again, through the process of this work, I have become keenly aware of and recognized all over again the awe-inspiring state which Shri Mahayogi embodies and the perfection of the words that Shri Mahayogi speaks, constantly chosen from a permanent state of razor-sharp, absolute discrimination that is beyond even time and space. Shri Mahayogi’s words are always delivered from the state of Truth, so if we derive our understanding of their meaning from the perspective of the mind’s view, the meaning can wander off on its own. May we be ever vigilant in protecting your Pranava at all costs. The words of Truth uttered by the Awakened Ones are truly alive. The words themselves are breathing and glistening with life. Unless the seeker knocks on the door, and then faces the test that awaits as we examine ourselves and gauge our seriousness, unless the seeker seriously seeks for It, and unless the seeker dives into the depths of the ocean to find the precious pearls for themselves, the teachings of Truth will not be revealed. In the words given by Shri Mahayogi, even though the words may not appear to be direct answers, there is a meaning that is hidden there that we need to dive in and penetrate in order to uncover. Yoga, in its original form, can only begin after one’s mind is prepared for religious awakening. The same can be said of the internal initiation Shri Mahayogi assents to give to his disciples. The mind of religious awakening is the unshakeable resolution and the unfailing determination to stake one’s life on Satori. Without a doubt, every single task in Yoga ought to be carried out with the same indomitable spirit. 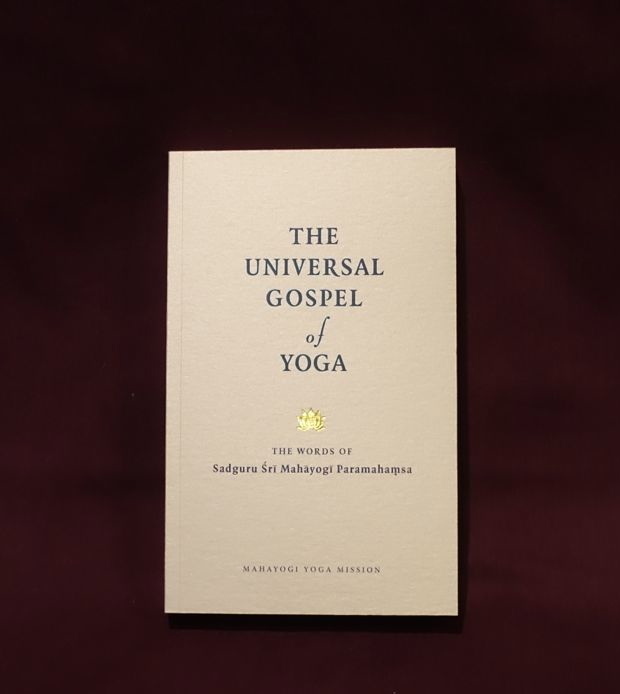 In undertaking this work, the completion of the third edition, I feel that the quality of the translation of The Universal Gospel Of Yoga has finally reached an acceptable level. Although it is only a small handful of members, I am so grateful to inform you that I have been tackling this project with a team of marvelous comrades who share with me this sublime ideal of leaving behind these records of the teachings of Shri Mahayogi, my Beloved. With our guiding belief that the task in which we are engaged will yield a book that will serve as a Bible that will be read by a massive number of people for many generations to come, we carry out this work with a great sense of responsibility. Perhaps, ten years from now, when our understanding has deepened and we find ourselves in a different state, then further depth might be revealed, but I believe that the work we have done is of the highest quality that we are able to bring forth at this stage. JAI SATGURU SHRI MAHAYOGI PARAMAHANSA KI JAI!!!!!! We would also like to mention Matthew and his involvement in our work. Although he has been living in Croatia for twelve years, he is one of the main editors of the MYM in NY. In spite of being far away from his motherland, the United States, and physically separated from the sangha in New York, The Universal Gospel of Yoga was the powerful vehicle that kept his heart connected with Shri Mahayogi every day for several years. When he left for Croatia in 2004, he took a copy of The Universal Gospel of Yoga with him. Of course, he had no idea that one day he would be fully involved in the project of editing the new edition. But over those years he developed a strong love for The Universal Gospel of Yoga and that can be seen in how wholeheartedly he dedicated himself to this work. 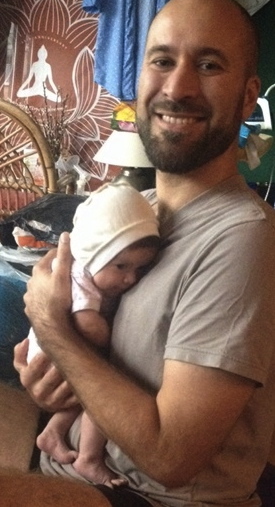 Matthew’s daughter Prema was born while we were working in August, 2015. Jai Our Dearest Sadguru Śrī Mahāyogī Paramahaṃsa Ki Jai!!!!!!!!!!!!!!!!!!!!!!!!!!!!!!!!!!!!!!!!! 7PM. Satsangha at the Ashrama. Every moment of having the opportunity to see Shri Mahayogi is filled with excitement and blessings. Once again, we were so fortunate to be able to attend Satsangha at the Ashrama and to be with Shri Mahayogi one more time before leaving for Tokyo on Monday!!! Anandamali reported to Shri Mahayogi about how their stay had been up until that point, and Shri Mahayogi seemed very pleased with the NY brother’s willingness to learn, their spirit of readiness for taking on challenges by adopting the learner’s mind and attitude, along with their discipline to follow the morning schedule at all costs. Taka and Yohei spoke about how they had been witnessing the transformation of their NY brothers, and they expressed how grateful they were to have this opportunity to host the NY brothers and practice along side them. Some gurubhai light heartedly teased Ryan, saying that he seemed to have already lost weight. There was much joyful laughter in the beginning. 無一物 ＝ No One Thing　→　‘Thing’ indicates ‘Pain-bearing Obstacles’ in the Mind. →　the cause of the ‘Pain-Bearing Obstacles’ is ‘Ignorance’. So, “the Absence of Ignorance and Pain-bearing Obstacles” = “The state of the mind that is empty and transparent”. 無 ＝ nothing 尽 ＝ run out; end 蔵 ＝ house → The word ‘house’ indicates ‘the universe’ or ‘space’. 無一物無尽蔵 ＝ In the Entirety of the Universe there exists one state that is Empty, Void of Pain-Bearing Obstacles = Bliss exists in the state of Emptiness. CONCLUSION: Make the mind free from Pain-Bearing Obstacles and Ignorance. Karma creates suffering in life　—tracing back to the cause of suffering→　desire, which is the attachment toward the pain-bearing obstacles in the mind; this is what creates karma. CONCLUSION: By eliminating ignorance and the pain-bearing obstacles, all suffering ends. True Bliss exists there. Ryan asked about how to proceed in the practice of discrimination. He wanted to know if he was approaching it correctly. He explained that he is currently trying to understand why it is that there is even something in his mind that desires. He noticed that this feeling of desire, or the value of an object only exists because he once had something and then lost it. He noticed that his mind only perceives two states: having and not having. Generally speaking, when he is in the state of actually having, there is no awareness, so it is only after the loss of it that he enters into a cycle of desiring similar types of things. Shri Mahayogi answered that Ryan must go further, examine the issue and discriminate whether the object of that desire is eternal or not, whether it is universal or not. By doing so, he will recognize the mechanism of the chain of desire that the mind itself creates based on specific conditions; and therefore truly realize that these are not the Truth. And what’s more, he will recognize that it is a mistake to attach to things that are not the Truth. This is discrimination. If he comprehends the essence like this, then the mind will become detached from that desire—that is renunciation. Nandi then asked how to know whether an intuition is correct or not. Shri Mahayogi answered that it goes without saying that practicing asana and studying the teachings of Yoga is a precondition. And that it is especially important to discipline oneself in yama and niyama so that one’s thoughts, words, and actions would not contradict one another. Through continuous practice, the mind transforms and its nature becomes the quality of sattva, and through having its nature be the quality of sattva, correct intuition comes. That too is about training. By continuously training one’s thoughts, words and actions to correspond to an intuition or that first flash of thought, the mind will ultimately stop generating all other unnecessary thoughts. By practicing this diligently, intuition will come precisely in the moment needed. Satya mentioned that she has a habit of sometimes letting her mind wander, and she knows that she needs to practice mauna at that moment. She asked for confirmation that by practicing to make the thoughts, words and actions correspond to one another, that the condition of ‘being empty’, or the original condition, would increase. After confirming that Satya was correct, Shri Mahayogi added that the word ‘empty’ in Japanese is written as 空（sky; void; empty), but in Sanskrit, ‘empty’ is sukha, which also means ‘easy‘, just as sukha is used in sukhasana (sukha-asana), commonly known as ‘easy’ sitting position. It was fascinating to hear that the word ’empty’ has a connotation of ‘easy’, as a profound metaphor lies within this association. Shri Mahayogi never ceases to amaze us with his depth of knowledge and ability to see beyond the surface!!! With this addition, Shri Mahayogi pointed out exactly what 『無一物無尽蔵』is all about!!!! In the Entirety of the Universe there exists one state that is Empty, Void of Pain-Bearing Obstacles, meaning that Bliss exists in the state of Emptiness. By eliminating ignorance and the pain-bearing obstacles, all suffering ends, resulting in the state that is Easy and Empty, where True Bliss exists. Jai Satguru Shri Mahayogi Paramahamsa Ki Jai!!! There was a congenial atmosphere after the Satshangha. Everyone’s face was shining. As people began to leave little by little, some moved to the side and began participating in a MYM work meeting. We wished we could have stayed there forever. But it was time to turn the page and move on to the next chapter; to work towards being able to show the proof of our growth for the next reunion with our beloved Master in New York. On Saturday morning, Aniruddha came to Yoga Vihara to investigate a loud noise he had heard that sounded like some animals running around. Sometimes this happens somewhere in the area between the ceiling of the ground floor and the floor above, and they have been having this issue for quite a while, which is especially common in old houses in Kyoto. Aniruddha is a professional, well-experienced exterminator who uses only natural pest-control products, and after studying the problem, he concluded that there were no rats there but most likely it was a weasel. Yogadanda and Satya, who live at Yoga Vihara, figured that a weasel wasn’t harmful, and so they decided to leave it be. We had a full day scheduled that day: Asana and Meditation class in the afternoon and Satsangha at night. In order to stay on schedule, Satya prepared an early light lunch. Anandi, who stayed over the night before, was also present. 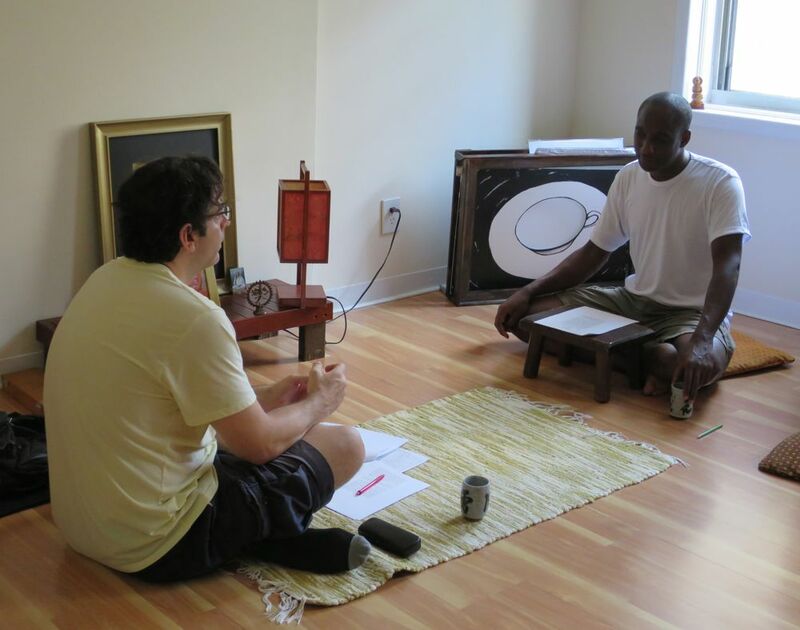 Now that there were only a few days left in Kyoto before they returned to New York, Aniruddha started thinking more seriously about how he would integrate some of the key lessons he was learning into his regular practice when he got home. The conversation naturally turned to diet, an area in which he was open to any possible improvements. He does not cook often but he would like to improve his dietary habits. He said that the problem was that due to the fact that his job is very irregular, he finds himself unable to maintain a regular schedule for eating lunch and dinner. His schedule changes from day to day depending on his clients, the locations and the time. He treats several apartments per day, so he travels from one place to another by car, but the situation is such that he often finds himself in areas where he cannot get a decent, vegetable-based meal, so he ends up grabbing something quick rather than eating a real lunch at the proper time. 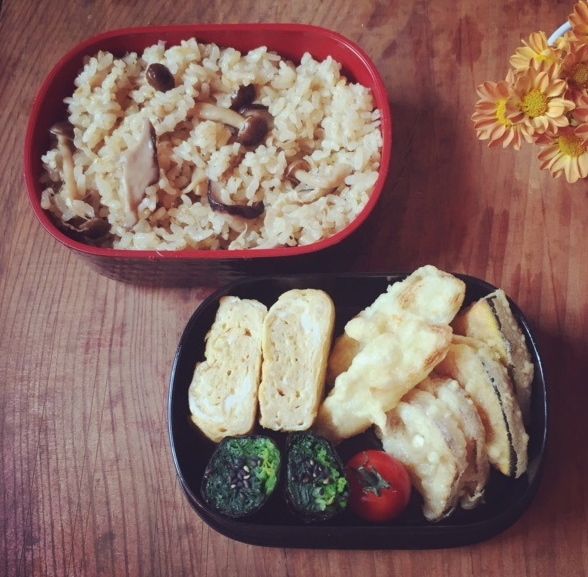 Hearing that, the Kyoto gurubhai responded that he should bring his lunch box with him, because in this way he can have lunch whenever he is able to and he won’t need to look for a place to get a decent meal. Inside the lunch box could be sandwiches or pasta, or even a soup, or something left over from the night before. He could even plan to cook dinner with an extra portion for lunch the next day. Aniruddha responded that he did not bring leftovers because he cannot warm up the food. He said, “I like my food hot.” That answer surprised everyone. Because it was not about his struggles in organizing his time or his schedule, nor was it about his skills or the content of the meal, but it related to his personal preference. Generally, if we are asked whether we would prefer to eat a meal hot or cold, almost everyone will answer that warm is preferable. But what we were discussing had nothing to do with these kinds of situations. If Aniruddha was seriously concerned about his dietary habits and really concerned about controlling the timing and content of his daily meals for the purpose of conditioning his asana and meditation practice, then any concerns about whether the food is warmed up or cold should not bother him. I want to realize the Truth. → For that, to deepen the practice is a must. 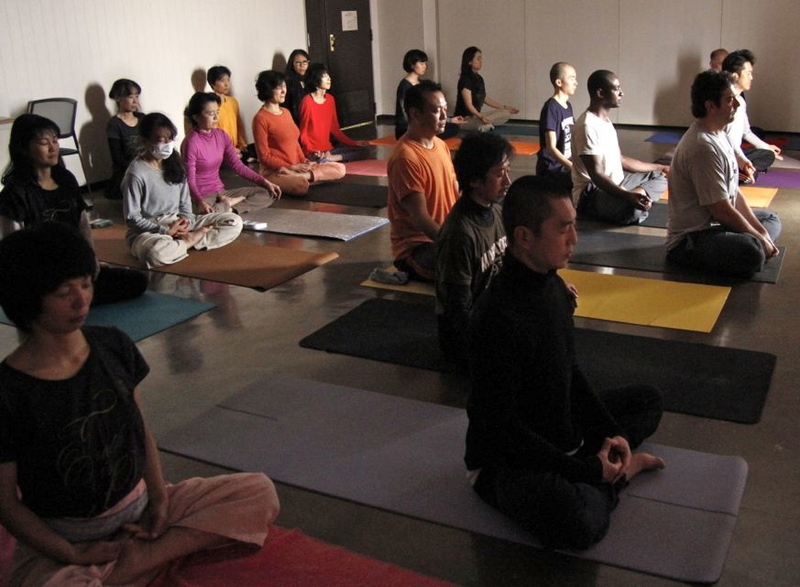 → For that, the practice of asana and meditation is indispensable. → For that, I need to practice them daily. CONCLUSION: In order to sustain my daily practice of asana and meditation, I can’t eat dinner due to the schedule of my job. Whether he was eating dinner or not, was not of concern. The aim can be realizing the Truth, uniting with God—although it is necessary to think with much more seriousness and in much more realistic terms, and that might relate to timing (for the real serious yearning might be different to different people.) However, it is truly easier to grasp your ideal and put it into action if you have a more concrete, detailed idea of what you are aiming for. Then it can be broken down and measured against our daily actions. For example, it can be as simple as the “discipline to practice asana and meditation daily.” Or if you are seriously concerned about dietary habits, the discipline to cook at home daily and stop eating out. It is natural that these concrete aims can vary according to one’s specific life situation. Whatever your choice might be, if you think about how you spend your day for the purpose of reaching your ultimate goal, you realize that there are actually many situations and points at which you must make choices one by one. For instance, let’s say that someone gives you a snack or a sweet, you can make the choice of declining it or having it later. Let’s say that you determined to cook at home every day and not eat out or order take-out. You are invited by someone to have a meal, or you see or find foods that you are drawn to or curious about and you want to buy them… At that very moment, recalling your concrete goal, and then making your choice based on that, is the actual first step of the practice of discrimination. Through repetition, making such choices in your daily life clarifies your goal more and more. Consequently, the shaft of light that is Yoga or Truth (your faith in Yoga) grows and eventually matures. At the same time, you will gain self-confidence. When that shaft of light gets stabilized and becomes firm, then you will be able to discriminate when disturbances arise in your mind. You might not have given much thought to these matters, and I do not know how you have practiced up until now, but if you really want to be able to discriminate as you said, I would suggest that you repeatedly practice discrimination using these daily situations, events and interactions as opportunities for practice. Then you will be able to apply discrimination when you face bigger issues more smoothly. From 2PM, there was an Asana and Meditation class led by Shantimayi and Dharmini. 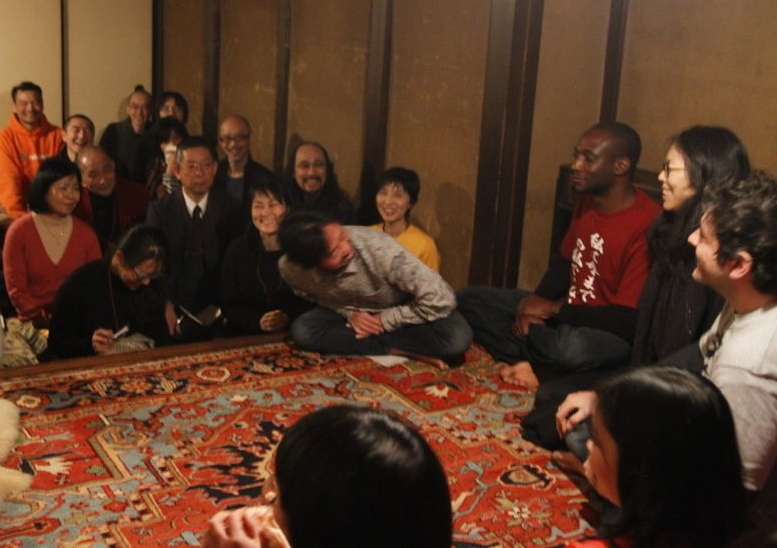 This weekend was the special weekend that the monthly Satsangha with Shri Mahayogi at the Ashrama would be taking place, as well as Siddha Marga the next day, so there were many disciples who had travelled from Tokyo, Matsuyama and other areas. The class was packed, and filled with a condensed energy by everyone in attendance. Shantimayi checked everyone’s asana very precisely. It was a wonderfully energetic class. 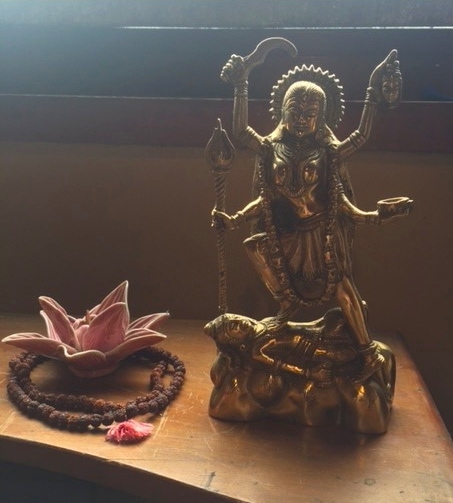 In the end, Shantimayi said that Yoga is not only the practice of asana, and that she has been taught that actually disciplining herself in the practice of yama (abstinence) and niyama (observance) in daily life, and making the corresponding actions with her body (action), mouth (word) and mind (thought) are the most important practices. She said that the result of your practice of aligning action-word-thought in daily life manifests in asana practice. And that she understood by her practice that unless you establish the harmony of ‘action, word and thought’ the completion of advanced asana would not be achieved. She added that if one acquires a good foundation in basic asana practice, it will surely lead to meditation, and therefore establishing that base is very important. Shantimayi asked the NY brothers about their impression of this class. Nandi started to speak, and he said that rather than speaking about this class he would like to express his gratitude for this entire trip to everyone. He said that this trip was quite challenging because he had to come face to face with his own issues, but he was so grateful to have had this opportunity and he felt so determined to continue to work on himself and deepen his practice. Ryan said that he was amazed that they could see in him more than what he could see in himself, and he was so grateful for everyone’s hospitality and support. Aniruddha said that it was a life-changing experience, and that he never lived his life with the ultimate goal at the center, but now he understands the purpose of living, and that his view toward asana practice has changed as a result. He also expressed his gratitude. After the class, Taka and Aniruddha went to Ganesha (the residence of Kinkara, where many meetings take place) to speak with Asanghan, who had travelled from Matsuyama, and ask if he could come to Yoga Vihara after the Satsangha that night. Asanghan was in the middle of a work meeting with Sananda and all the gurubhai from Matsuyama, but he came outside the house to speak with them. At first, Asanghan hesitated to accept the request because he had a prior engagement, but their persistence persuaded him to change his schedule. 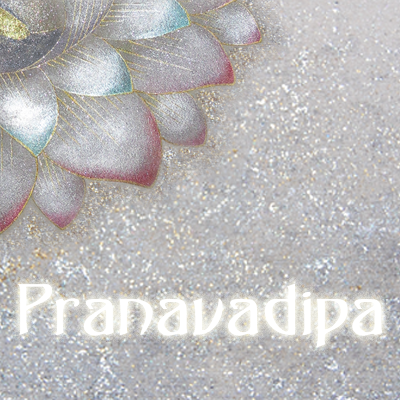 Pranavadipa 18 is up and the topics in the Satsangha are in synchronization with these conversations! Please read, reflect upon them carefully, and turn them into action! Friday morning arrived with the feeling of rejuvenation in the air. The three brothers all said that the visit to the public bath the night before had paid off, and they were fully restored and reinvigorated. 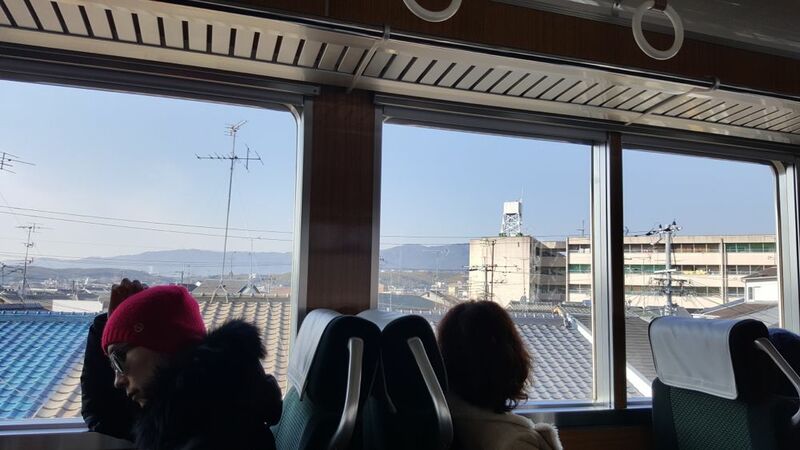 To start the day off, we accompanied Yohei to his workplace, the Sakura Home-Aid Service in Arashiyama, travelling first by bus and then by train. Taka came with us as well. Yohei is registered to work at this social service center and has been working there for about 5 days a week for three and a half years. He attends to around seven clients per month and serves 1 to 2 clients each day. His work is to support them when they go out to do various activities, to do housework, and to help them with their physical care, either at the Sakura facility or during home visits. Yogadanda also works at the same location. Sakura is both an agency that provides social and home aid services and serves as a residence for people with disabilities. It was originally founded by three people, Mr. Takahashi, Ms. Makino and Mr. Horie, and we were fortunate to meet all three of them during this visit. One thing that is unique about the Sakura residence is that it is a not an institutional looking home, it is a house that is architecturally barrier-free and the residents can actually live in private rooms and enjoy a comfortable standard of living. There are also opportunities for them to work right there on-site as full time employees. One of the founders, Mr. Horie, uses a wheelchair to get around, and so the concept of Sakura was developed with a firsthand understanding of the challenges faced by people with special needs, both in an emotional and physical sense, and also in the context of their place in the society as a whole. It is common for people with disabilities in Japan to work at specialized community work centers, where they can do various jobs to engage in society and support themselves, but the pay is extremely low and it is barely enough to live on. Unlike the typical work center, Sakura offers an environment where people with special needs can work and earn a proper income if they have computer skills or other useful talents. 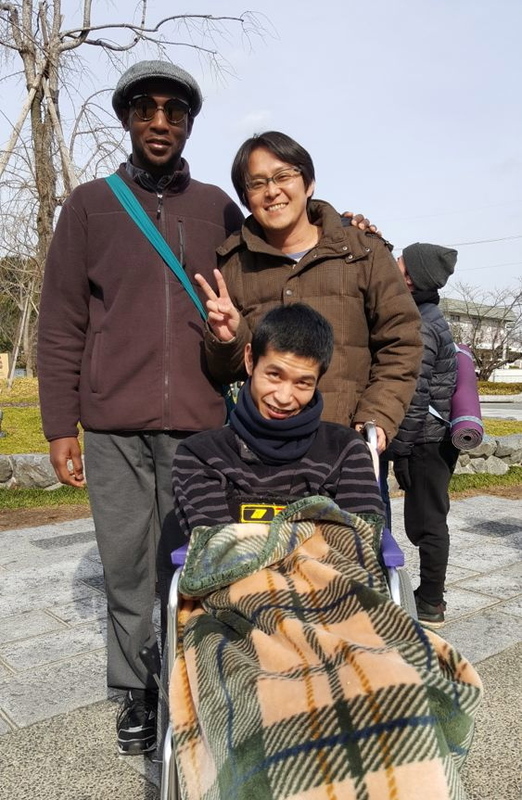 Currently, there are five people with disabilities who work there, and there are three who are living in the housing facility, one of which is Mr. Horie himself. 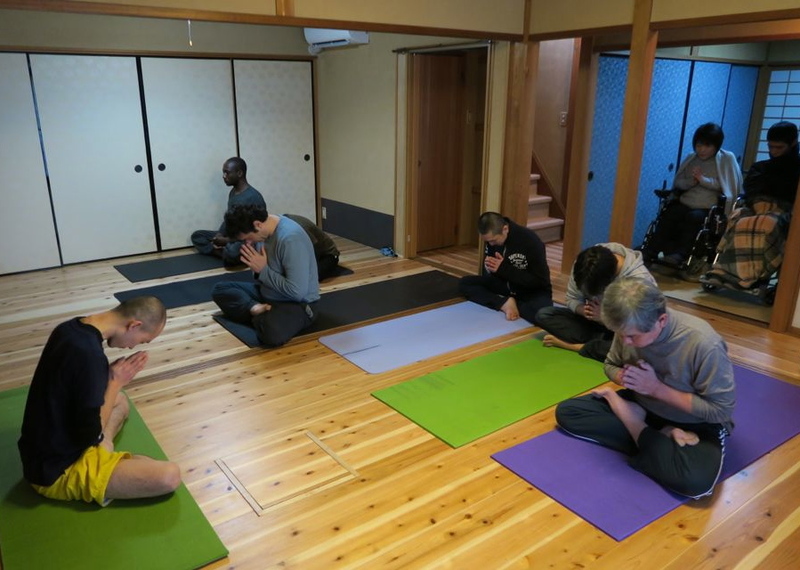 At the request of Mr. Takahashi, Yohei has been offering an Asana and Meditation class once a week since last August. 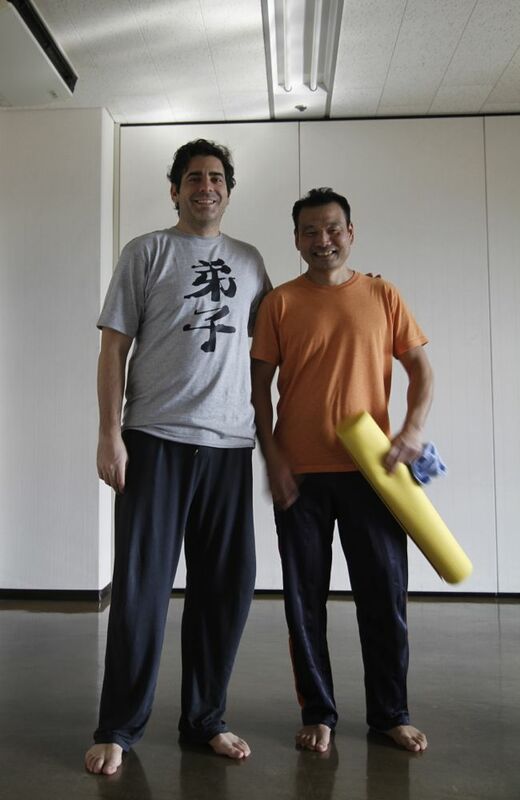 The class was begun because Mr. Takahashi wanted to try asana and meditation in order to improve his own health, as well as take care of the helpers at Sakura in order to prevent or heal their chronic lower-back pain, which often arises as a consequence of their hard work. When we got there we could see right away how friendly Mr. Takahashi and everyone else was, and how eager they were to welcome this unique group of visitors. The attendees at the class that day were the three founders, one of the attendants and one staff member who herself was wheelchair user. 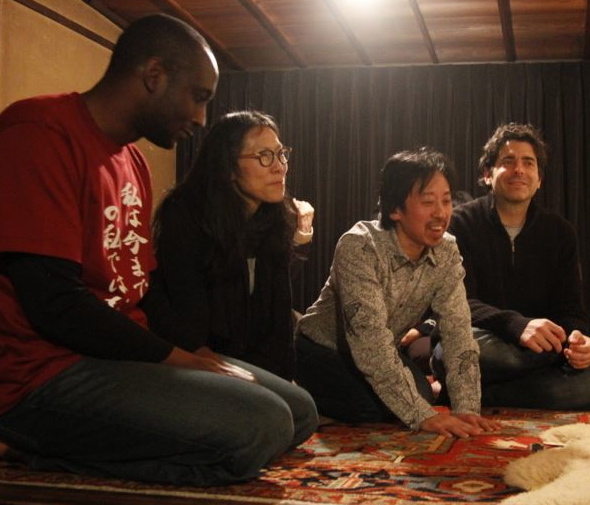 They all practiced in silence with the brothers from New York as Yohei led them. 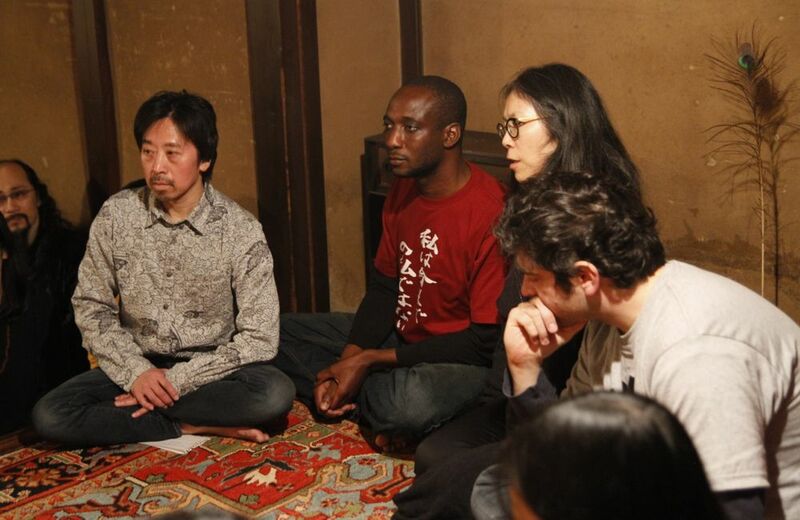 There was great harmony in the class, and the people from Sakura and the brothers from NY were mutually inspired by each other’s dedication and sincerity. We hope that they will continue and discover for themselves the power of asana and meditation practice, going further into the journey of searching the Self and for real Freedom. After that, Mr. Takahashi invited us to have homemade soba (buckwheat noodles) for lunch, along with Mr. Horie and his helper, at a place nearby. 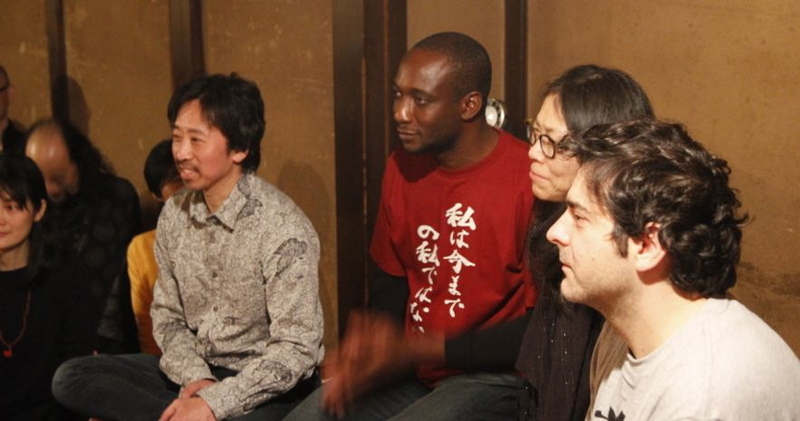 This gave the NY brothers the opportunity to see how soba noodles are formed. When he was in junior high school, Mr. Horie was diagnosed with a physically debilitating condition that will worsen over time. He seems to be a charismatic, very intuitive and artistic thinker. Mr. Miyaji, Mr. Horie’s attendant that day, was bringing food to Mr. Horie’s mouth. Again, it was a meaningful experience to see Yohei’s work firsthand, and it was also a great discovery to learn about Sakura and the worthwhile mission to which they are dedicated. Unfortunately, we didn’t have enough time to really get to know these three founders, but from the little bit of interaction we did have with them, we could feel that they were truly flexible, open-minded, and blessed free spirits!! And what was most noteworthy was that they demonstrated their beliefs in their actions, which is something that we, as aspiring yogi and yogini, strive to do in our daily lives as well. We are truly grateful to have had this experience, thank you so much for letting us be a part of Sakura, and hopefully our paths may cross again someday! After we had said our goodbyes, Yohei went back to work and we headed off to the center area of Kyoto with Taka. This afternoon would be the last chance to pick up a few souvenirs to bring back to New York, as our trip was nearing its end. During our visit to the center of the city, Aniruddha and Ryan got themselves special T-shirts, which you will be able to see in the photos in the next blog (Echo 47). Taka and Yohei had to work the nightshift that night, so we went to Yoga Vihara for dinner, which consisted of a special ramen (noodle soup) that is a well-known dish from Yogadanda and Taka’s hometown, Fukuoka. (Yogadanda and Taka are brothers.) Kripalu and Anandi were also there. Anandi had travelled from Matsuyama, in Ehime prefecture, by long distance bus in order to attend the satsangha at the Ashrama the next day (Saturday) as well as Siddha Marga on Sunday. It took six hours for her to get there from her hometown. There were times that she used to come to Kyoto almost every weekend, but now she comes once or twice a month. One week had passed since their arrival to Kyoto. And the Kyoto gurubhai knew that the NY brothers’ main theme for this visit was discrimination, how important it is to clarify one’s issue for the practice of discrimination, and how to make one’s ideal concrete in order to aim for the target. The Kyoto gurubhai were really trying to help the NY brothers grasp the real practice of discrimination in daily life. Yogadanda spoke the following example of his meditation experience. Years ago, there was a time that Yogadanda was working as a dishwasher at the restaurant in Kyoto hotel. At that time, there was an elder lady who was also working as a dishwasher part time job, like he was, and she had a quick temper. One day, she got mad at Yogadanda for unreasonable things. But that shock curved in his mind as a strong impression. At that time, he had a habitual routine of practicing asana right after getting home from his job, so he practiced asana when he got home as usual. But while he was practicing asana, that woman’s face was there all the time, and he could not get rid of it until he finished all asana. As he sat for meditation—at that time, he was meditating on Shri Mahayogi—the lady’s face was always there, disturbing his concentration on Shri Mahayogi, and she did not disappear. He struggled very hard to try to focus on Shri Mahayogi. He did not know how long he was there in this condition, but in the midst of this battle, an intuition came that “I and this lady are the same existence,’ at which point he felt that, “Most likely something happened to this woman that caused her so much stress that it built up within her, causing her to burst out in an attack towards me, who happened to be there.” “I also have the mind that is of exactly the same structure as hers, and I too would burst out at some point if I built up my stress continuously like that.” “I am, essentially, the same existence as she is.” As he felt this, the light shone from Shri Mahayogi, the object of his meditation, and the face of that older lady melted away into light. He said that he was meditating on the form of Shri Mahayogi, but by the teaching of Shri Mahayogi—“Every existence in its essence is the same existence”—discrimination happened within him. He thinks that that was why he experienced this teaching of Shri Mahayogi in his meditation, as well as Shri Mahayogi’s form and the teaching of “Truth is One.” The next morning he went to work as usual. Before this experience, when similar things would happen, he must have felt that he did not want to see that person or even go to work, but there were no such thoughts. Therefore, he dealt with the same older lady neutrally, as normal. Later on, he got long with that lady, and since then he has never been attacked by her for any unreasonable matter. He understood that before she was hard for him to deal with, so unconsciously he had the vibe of “avoiding”, however, through applying discrimination in meditation, he was able to conquer this feeling, and so his vibe changed. The Kyoto gurubhai began to ask some questions related to these topics. Nandi said that he chose Swami Vivekananda as his ideal Saint. So Anandi asked him more precisely what it was that he likes about Vivekananda, or how he concretely idealizes Vivekananda. She asked him this because at one point she wrote an article about Swami Vivekananda for Paramahamsa. And that experienced caused her to deeply ponder how she could actually bring her way of life and her conduct closer to his mind and spirit. In contrast to that kind of focused inquiry, it appeared that Nandi’s answer was still very general. 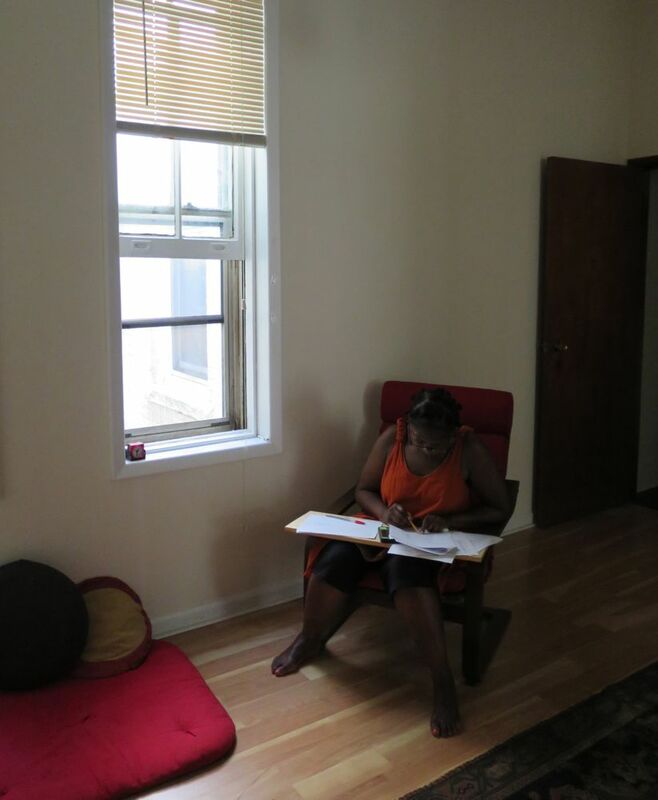 Satya, who came to Yoga Vihara on their second day after the satsangha and spoke about the practice of discrimination through her actual experience, tried to help them get a better understanding of the process of discrimination that night again. She asked Ryan what he had been discriminating on. Again, Ryan’s answer was somewhat vague, something that could be resolved without engaging too deeply in discrimination. Then Satya asked, “Do you know about yama and niyama?” She asked this because she inferred from what he said that it sounded like he had been observing his conduct in daily life, which is a positive thing. So if he were to apply yama and niyama to his actions and then observe them, what he has already been trying to do can then become discrimination. Ryan said that he knew the yama and niyama, but he has not really been consciously practicing them. So Satya explained that if we practice yama and niyama in our daily lives, consequently, the practice of discrimination, meditation and asana can advance more rapidly. The obstacles in meditation, or the thoughts that arise in meditation, are often impressions that are recorded in daily life, and further, most of them are caused by not being able to be consistent with yama and niyama. That means that if we remain vigilant and pay close attention to our conduct in daily life, we can practice asana and meditation with full concentration, since our impressions will not be recorded in the mind, and therefore thoughts will not arise while we practice them. Some of the yama and niyama may sound very simple, yet if we want to practice them thoroughly and perfectly, it is an extremely difficult practice, as if we are being tested from moment to moment. Ultimately, if we practice making all of our actions and words correspond to yama and niyama, 24 hours of each and every day will become Yoga. And if we can practice observing any one of them diligently, it will end up encompassing the observation of all the yama and niyama. By the way, the meaning of her name Satya is Truth, and it is in one of yama: Satya is Truthfulness.